We are few days away before Christmas. Sooner or later I will become busy from buying gifts for my family, friends, for myself and for my special someone ☺. But due to busy schedules from work and lack of time to go shop from mall to malls. I decided this year to purchase my Christmas gifts from online web shops. Nowadays smart people uses computers, tablets, or mobile phones to purchase anything. Because orders are just few clicks away and to be delivered anywhere you want. Practical right? Online shops is not that expensive. Actually it can help you to save money using coupons. a Every serious online shoppers uses coupons. But let me tell you what I found! A site where thousand of coupon codes are distributed for free. No registration required. Introducing SALEDUCK, a site where online web stores posted their promo coupons. The first time I saw this, I said "WOW, lots of coupons". :) Unlike other coupon site that provides fake coupons. 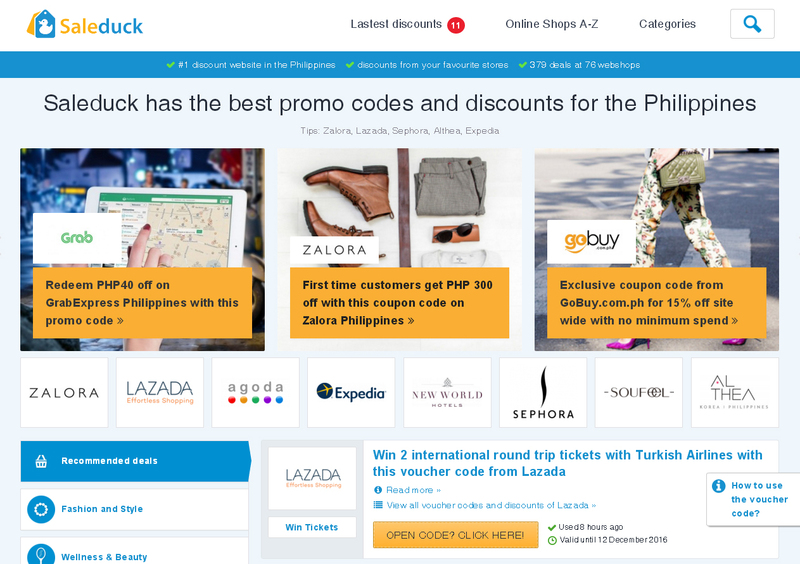 Saleduck is partnered with big online webshops like: LAZADA, ZALORA, AGODA, EXPEDIA, NEW WORLD and more. Currently Saleduck is partnered with 69 webshops and growing which means it is a legit company and gives valid coupon codes. Without any doubt Saleduck is the leading coupon site in the Philippines. Whatever your interest is, they cover everything! From fashion and style, wellness and beauty products, shoes or clothes, technology related, hotels , travels or vacation rentals; Their coupon codes and offers are simply the best! I dare you to subscribe to their mailing list to get the hottest coupon before someone snatched it. 1) First head to their website: http://www.saleduck.com.ph , their website is responsive you can also view their site in mobile and tablets. Site is divided with different categories. For instance my favorite is the Technology field. 2) A list of webshops in the technology field will appear. 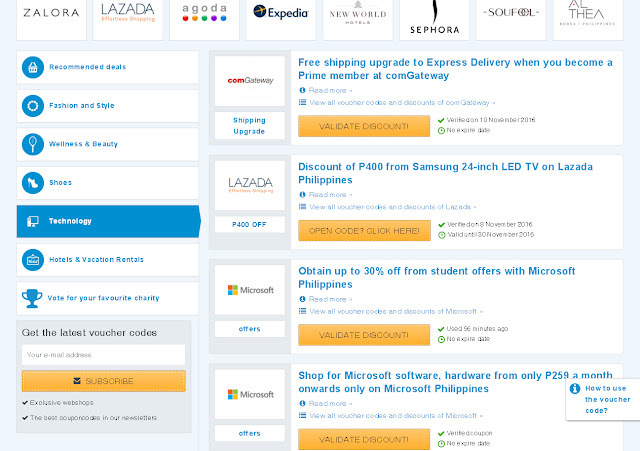 Select the desired voucher code. 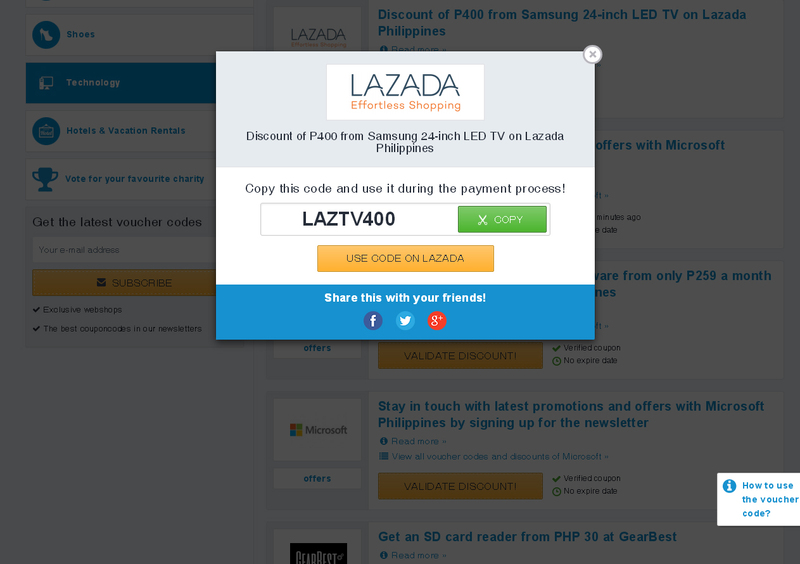 3) Click the "VALIDATE DISCOUNT" button. This will open a new window with the coupon code. Take note for the coupon code and use it before purchasing from your webshop. 4) Enjoy your discounted product! Saleduck is for everybody. • Some voucher has an expiration date. So better use it before it become expired. • Some voucher has a certain number of usage. This type of voucher will be disabled once the target purchase achieved. • Sale duck is best to use on holidays like: Christmas, New Year, Valentines, Mothers day, Fathers Day, Halloween etc. 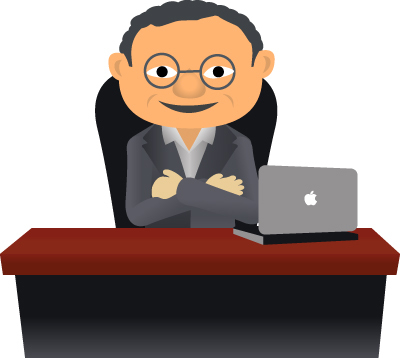 • To keep being posted, Saleduck has a news letter. Subscribe and get the latest coupon codes everyday.